Natural gas prices won’t be this low forever. If you’re planning ahead to save some green, you may want to think about going green. Solar hot water systems are reliable, low maintenance, use a renewable energy source, have a pretty quick payback and in the long run, save money. Right now, you may even be able to take advantage of government tax incentives and rebates from electric utilities to help offset installation costs. Solar hot water systems use the sun’s energy to heat water and, in Wisconsin, must be used with a conventional water heater since you can’t rely on energy from the sun year-round. The technology is not new. As far back as the turn of the 20th century, solar hot water systems were used in homes in southern California. Today, solar hot water systems are used in everything from hospitals and prisons to residential homes and park bathrooms. One of the most energy intensive, and therefore most costly, processes in any house is heating water. Heating water accounts for more that 20 percent of home energy use in America. A solar hot water system can take care of about 70 percent of your hot water heating, so you can see where it can save a lot on your power bill. 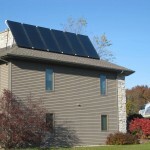 The H & H Group out of Madison, Wis., has been installing solar thermal systems since 2007. The company’s marketing director, Chris Collins, says not everyone should install a solar hot water system. 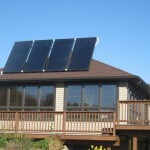 To heat water using solar energy, the solar panel, or collector, is fastened to the roof. A glycol water mixture, which includes water and antifreeze (propylene glycol, which is food-grade, safe and recommended by Focus on Energy), is pumped through copper piping inside the collectors where it is heated by the sun to about 180 degrees. Once heated, the water flows back to a collection tank in the basement. The potable water flows through a heat exchanger or around a copper coil inside the collection tank that is heated by the fluid from the collectors. Since the water is pre-heated before it goes into the water heater, the water heater does not need to fire as often, reducing natural gas usage and therefore, saving you money. This type of collector can provide enough hot water for your showering and washing needs. If you’d like to learn more, you can contact the solar energy professionals at H&H at info@hhsolarenergy.com. Solar water heaters were tried here in the 1970′s and had limited success. Since that time there have been signifiacnt improvements in the panel technology. Although they are now more efficient, the cost vs. savings or payback remains in question for me. The current government rebates as well as Focus On Energy rebates make it more appealing. Without the rebates though the economics are questionable in our area. Make sure you use enough panels to get the best performance possible. You will still need an electric water heater for the make-up heat in the four or five months that the solar isn’t able to work at it’s peak performance. We still have many choices to heat water and all I can say is “use a professional to get the best and most safe installation for your money”. Solar water heaters is beater then Electric water heaters. Surefin Coils|custom/replacement heating coils, chilled water coil, cooling coil, heating coils and more! I like the helpful info you supply on your articles. I’ll bookmark your weblog and take a look at again here frequently. I’m fairly certain I will learn many new stuff right here! Best of luck for the following!